When Annabel and Richard Lewis became the custodians of a listed building owned by the National Trust, their aim was to preserve the property rather than change it; and their mission was to stop things crumbling and decaying. The trouble was, the vetting process had taken so long that the house was covered with ivy, the garden was overgrown and the property was almost derelict by the time the couple were able to move in. Discover how they went about restoring it, and how Annabel fills it with fabulous festive frills at Christmas. For more inspiration, see other real home transformations and our restoration advice for practical information. For the woman who made her name – and her business – in exquisite decorative trimmings, Christmas is an opportunity to really go to town. Whether it’s bringing the hedgerow inside with faux garlands, branches, birds, and berries, or the glorious ribbons tied around every parcel – and in fact around every available space – Annabel Lewis, founder of V V Rouleaux, knows how to dress things up for a colourful celebration. ‘Everyone’s so safe with everything,’ she says, glancing round her dining room, where at each setting a crisp linen napkin is topped with a plum-coloured ribbon; each antique dining chair is upholstered in a different shade of silk damask; each chair back has a wreath topped with a luscious moire red bow; and handpainted baubles in vibrant tones of orange, red, and gold are suspended in the air like vivid bubbles. ‘I just love using colour and texture and making something different. We’re not minimalist anymore. 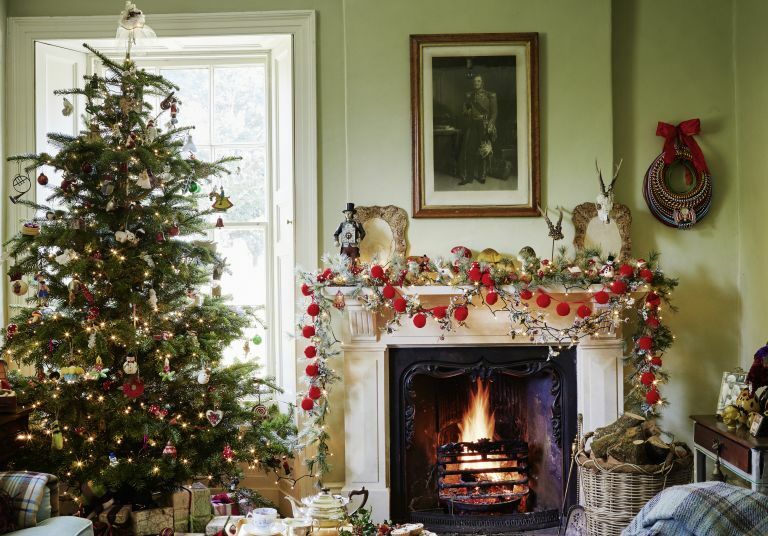 We want to be maximalist.’ And it’s true, her Cumbrian farmhouse is decorated to the max this Christmas. It was a quirky tree decoration, worthy of V V Rouleaux, in the garden that attracted Annabel’s curiosity, seven years ago, as she explains: ‘Richard and I were fishing on the river here, and noticed a bicycle in one of the big oak trees. The couple living here told us it’s an Italian tradition to put a bike in a tree when a new baby is born.’ They also told Annabel they were about to move back to Tuscany to be closer to their new grandchild and that the house was owned by the National Trust, who couldn’t find a new tenant. It was a fortuitous discovery, as Annabel had decided to return to her Lake District roots when the lease on V V Rouleaux’s London warehouse expired and the children had all left home for university. ‘So I got in touch with the Trust and told them we wanted the house.’ Sorted. Not quite sorted. The vetting process lasted almost three years, as the National Trust grilled Annabel and Richard about how they would go about maintaining and restoring the property before they finally allowed them to be its custodians. ‘By that time, ivy had spread all over it, the garden was overgrown and the house was almost derelict. Apart from clearing the garden to restore the sweeping view of a ‘brilliant trout and salmon stream’ Annabel was free to concentrate on the interiors, with the National Trust responsible for any structural and exterior upkeep. Like an expert chef, she mixes trimmings and decorative accessories in unexpected pairings, creating bold and exciting new flavours. ‘People want to be different – people are making individual things themselves now and they want something unique, not just off the shelf. ‘V V Rouleaux is an ingredients company,’ she says, ‘for everyone doing anything, for display, decoration, interiors, fashion and theatre.’ And – as any expert chef will tell you – with the best quality ingredients, in the right combinations, the results can be delicious.